Ring entered the home security sphere with their Video Doorbell, a product that was well-received. Since, the brand has launched a Stick-Up Cam to accompany the Video Doorbell. The Ring doorbell installation can be a lot more difficult, so you might want to look at some installation guides. The Stick Up Cam is similar to its doorbell counterpart, except that it can be placed anywhere instead of one fixed location and is easier to install. This is a Ring Stick Up Cam Review. So, in a home security market that feels infinitely crowded, where does Ring system sit among the pack? Does the Stick Up Cam operate solo, or will users need to combine it with other Ring products to get the most out of the tool? The Stick-Up Cam is a product that can be placed just about anywhere. It comes with a security mount, quick release mount, and a screwdriver and drill kit with screws to make installation easy. It’s recommended to use as a camera to watch the front door, back door, or other points of entry, but it can just as easily be placed indoor. Multiple Stick Up cameras can be purchased for more extensive coverage. The Stick Up Cam clocks in at $199. It has 720p HD video, two-way communication, infrared LED’s, an 80° field of view, and since it’s weather resistant and wire-free, you can mount anywhere while you see, hear, and speak to visitors. The Stick Up Cam also allows users to customize motion zones and sensitivity. 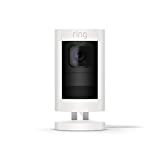 Ring offers optional video cloud recording and storing that lets you view and download up to six months of activity. Customers can receive 30 days for free, but after that Ring charges $3 dollars a month or $30 per year. One of the more interesting aspects of the Ring system is that the company recently added a solar panel for $49 which can connect to the Stick Up Camera via a micro USB cable. With only a few hours of sunlight, this product will keep the Ring cam continuously charged. The rechargeable battery is internal and no additional batteries need to be purchased. Ring is said to have around 6-12 months of battery life before requiring a full re-charge, but many people have reported that the battery life did not end up lasting that long. 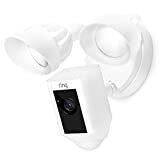 The Ring products have been well reviewed and people seem to like them, but the Ring Stick Up Cam doesn’t actually seem to be very much different from the doorbell, it just doesn’t have the doorbell feature and it has a smaller field of view. Some might get discouraged after reading a Ring security system review and looking at the difference in features. Initially Ring products were launched without a video-streaming feature, but the brand has fixed the issue. There’s some issues with battery life and the Ring motion detection. Many people have reported that the battery life does not meet expectations. Some customers have reported the Ring motion detection issues including a lag, detection that was too late or early, and for some, detection was non-existent. Others reported that the system is extremely sensitive and the high sensitivity can cause false reads. All Ring products have the option for cloud service, but one of the unfortunate aspects of the product is that if you want to have cloud coverage, you will have to pay for the service on each individual device that you would like to be covered for. One of the main problems with the Stick Up Cam is that it appears that the product will work best for people who also have the Ring Doorbell, so customers who have both systems installed, because it isn’t a thorough home security offering. It’s extremely limiting, and the product doesn’t really make sense as a stand alone device. Stand alone it’s basically just a glorified camera. Even under the assumption that a customer were to purchase both the Ring doorbell and Stick Up Camera, these products alone are missing many of the essentials of home security, including other home detector devices and professional monitoring to respond to a burglary. One approach to make the Ring system work as a wider security offering would be to purchase multiple Ring security cameras to place in multiple locations, but this approach could end up being rather costly. This combination of Ring devices will mostly be useful for people who need the bare minimum in their home security and have modest needs. Ring is a fine product, but it won’t give customers everything they need. We suggest opting for an all-inclusive home security offering.